I spent three of my four high school summers, in between pre-college programs and summer swim team, shelving books at my local library. I envisioned it as romantic, glamorous, the kind of thing quirky and intelligent girls who roll their hair into ponytails around uncapped highlighters (in a strange imitation of the more culturally offensive trend of chopstick-like hair décor) do for a summer volunteer position. I thought I would be able to read the volumes as I shelved and stocked, and I certainly thought I would be allowed to sit down sometime in my four-hour shift. I was wrong on both accords. The most wonderful part of the job, however, and the reason I kept returning each summer, was the occasional delight of uncovering a diamond in the rough—a book, usually nonfiction as it was uncharted territory for me, on a completely interesting or ridiculous subject. I read travel guides as if they were novels and devoured cookbooks in my spare hours. I liked learning. Pasty and hollow-eyed from spending hours inside in the dead of summer, I was intrigued. And then I discovered a book that would change the way I look at science, LSD, love, and art. There was a graphic novel, tucked in the back behind the Marvel and DC comic books, about Richard Feynman, the Nobel Prize-winning physicist. 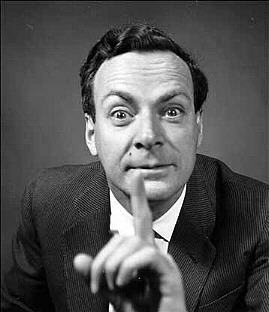 I’ve always had a deep love for Richard Feynman. I have no idea what any of the theory he won the Nobel Prize for actually means; I think it was something to do with quantum mechanics and even that term I don’t have a solid definition for. But I love his autobiographies. This breathtaking Princeton scientist was whimsical, lighthearted. He wasn’t afraid to poke fun at himself. He talked about his high school girlfriend. And now, standing in the library in the middle of June, I had discovered that some humanities nerd also like Richard Feynman and created the most unscientific form of documentation about his life possible. I sat down between the aisles and didn’t move until I had finished it.